The owners of the business argued that wheelchairs pose a danger to their cats. 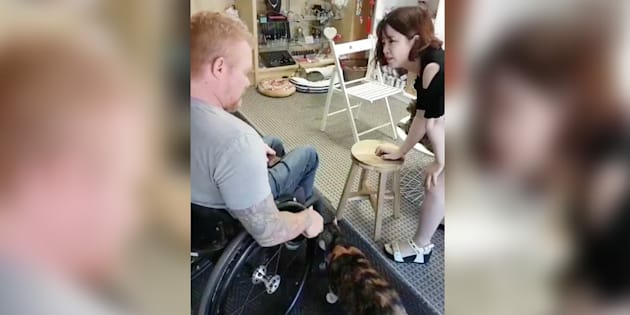 Paralympian and law student Jeff Adams spent an uncomfortable few hours at Meow Cat Café in Toronto after hearing the business turned away a 16-year-old because he uses a wheelchair. The issue of accessibility in Canada is larger than one cat café in Toronto, paralympian Jeff Adams says. Meow Cat Café was in the news all weekend when Global News reported that a 16-year-old wasn't allowed inside for a birthday outing because he uses a wheelchair. Adams went to the café Friday after seeing the report. He hoped there was more to the story, Adams told HuffPost Canada in an interview, but quickly realized there was not. "As soon as we went through the door, she was yelling 'No wheelchairs, no wheelchairs,'" he said. "It seemed incredible, in the true sense of the word." The owners told him he could only come in if he left his wheelchair outside, and then said he could come inside if he didn't move. Even when he was stationary, the owners took the cats away from him when he tried to pet them. Adams and his partner captured their time inside on video and posted it online. "This is a place where the cat's safety is priority," the owner can be heard saying. "You keep moving, why? You are blocking the customers." The interaction was "awkward times a thousand," Adams said. The owners eventually called the police after Adams insisted that he should be allowed inside and served. Police never showed up. The café appears to have closed its doors. Adams saw a sign on its window Saturday announcing that the cats were "in a state of too much stress and anxiety" after being around people with wheelchairs and walkers. Update: The Meow Cafe people have turned their amps up to 11. They may have came through on their promise to close shop instead of allowing people who use mobility devices to enter their premises. Erica Yun, the café's co-owner, declined to do an interview with Global News on multiple occasions. She did not respond to HuffPost Canada's request for comment. The sign on the café's door also accuses Global News reporter Matthew Bingley of lying and disregarding the owners' point of view because they are "weak women and Asians who don't speak English well." Adams pointed out that the discussion online did become racist. "It was never the intention to make that the issue," he said. He just wanted to spark a discussion about accessibility. Once or twice a year, he's asked to leave restaurants and businesses because of his wheelchair. These experiences even inspired him to study law at Osgoode Hall, York University's law school. "People have these deeply-rooted and heartfelt beliefs that people with disabilities should not be allowed, not even welcome but not even allowed, into their place of business," he said. "It's really difficult to undo all of the negative messages that have been drilled into people." Adams said he's optimistic about a law the federal government tabled in June. If passed, it will create an accessibility commissioner and regulations for sectors that fall under federal jurisdiction, which includes banking, transportation and telecommunications. Businesses that don't comply could face fines up to $250,000. "Honestly, it's really the only way to make accessibility happen," Adams said. "You can't sue people into liking you. You can't bring a lawsuit to make someone accept you."